People spend their income on goods and services. (Some of this spending occurs through taxes paid to the government.) Many people also give away some of their income to churches or other charitable institutions. Income that is not spent on goods or services, paid in taxes, or given away is saved. People typically save their income at banks, credit unions, or other financial institutions, which then channel the savings to borrowers and investors, usually businesses. The financial institutions pay interest to savers and charge interest to borrowers. 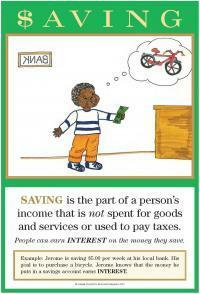 Often people save by making personal financial investments in securities such as stocks and bonds. People who purchase stocks hope to earn dividends and also hope that the value of their stocks rises over time. Discuss the advantage of putting savings in the bank or other financial institutions instead of "putting it under the pillow." List various ways to save money. Discuss the advantages and disadvantages of each way to save. Write a short paragraph on where you want to save your money and why. Discuss the advantages and disadvantages of borrowing to purchase a car versus saving enough money to purchase one. (This will lead into a discussion of purchasing a new car versus a used car.) Use the Internet to find out different loan rates for cars. Have a local banker visit the classroom to discuss the banking business and encourage students to open a savings account. Use the Internet or call various banks to find out current savings rates on different savings accounts, certificates of deposit, savings bonds, etc. Make a chart showing the different rates at different banks. Discuss why there are differences and how banks compete with one another for customers. Study the stock market or participate in a stock market simulation. Track specific stocks over a period of time. Determine if you would have gained or lost money on a stock purchase. Have students cut out pictures from magazines or catalogs of different goods that they would like to buy. Discuss long-term and short-term savings plans for purchasing these goods. Plan a simple budget for an allowance. The budget should include spending for goods and services, charitable donations, sales taxes, and savings. Lesson 10: Saving and Investing - Do this lesson after using Lessons 8 and 9. In all three lessons, students make hamburgers out of modeling clay!